Mortice deadlocks are far more secure but always require the key to lock/unlock. On most front doors you will have both a deadlock and Yale lock. This allows for maximum security and convenience since the deadlock is often only used during prolonged periods of absence. When it comes to replacing your locks, the cheapest option is to replace the key and cylinder within your Yale lock. There is no need to change the whole unit for Yale locks but deadlocks will require a whole new unit. Can I Fit or Replace a Yale Lock Myself? It’s possible to fit and change locks on your own, but it can be tricky without the correct tools and experience. Plus you will be putting your property at risk if the lock is not fitted correctly. It’s well worth employing a professional locksmith from a site like Quotatis to carry out the job correctly and keep your peace of mind. The price for fitting a standard deadlock to a wooden door, including parts and labour, should fall between £125-£250. The price may increase depending on the size of the business used and your local area. Now let’s consider you want your entire Yale lock replaced. The average price for an off-peak call to a locksmith to fit a whole new unit is £125-£225. This includes both parts and labour costs. If you only need the cylinder and a couple of new keys provided you can leave the main unit as it is. This is an ideal choice if you are concerned about additional copies of your keys. Expect to pay £70-£150 for this job. What About Replacing the Front Door? Before replacing a front door, you must be aware that it is a “controlled fitting”. This means you need to comply with government building regulations. Your local building control needs to be informed if you plan to undertake the work yourself. It’s possible to complete a new door fitting yourself but having professional joiners/carpenters will make your life much easier! They will have the job completed quickly and prevent issues arising with building regulations. Locks can be challenging to fit correctly so you can leave this to them too. Choose either a complete door set or new door to fit within your existing frame. Take precise measurements of the door opening and required dimensions. Make adjustments by trimming the door if required. Then route out rebates. Use a Chisel to dig recesses for hinges then secure them to the door. Fix hinges to the door frame. Fit locks and door furniture to the door. The easiest is to purchase a complete door set. This includes a new door pre-hung in a new frame. The problem with trying to fit new doors into existing frames is the tenancy for a mismatch. The frame may not be completely square or have odd sizing. In these cases, your door may need to tailor made or carefully modified to fit. It will cost you £160-£200 for a professional to come fit a new front door in one day. What type of lock is fitted to the front and rear doors of your home? 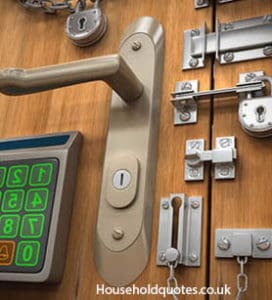 Deadlocks that meet British Standards are likely to provide a discount. These types of lock found on UPVC doors will be recognised as very secure. Yale deadlocks use both internal locking handles and a night latch. They are very likely to gain recognition from your insurance company. Word of Warning: When declaring locks for a discount, you must be certain of the exact lock fitted. Otherwise, you risk invalidating later claims if they discover a mismatch. I charge just £25 for a single door conservatory lock cylinder change – so yes you were definately scammed !